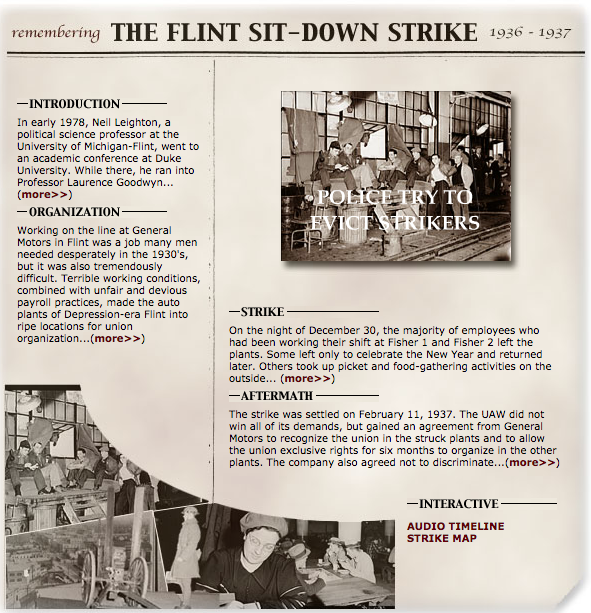 Known as one of the most iconic labor movements in the nation, the 1936 Flint Sit-Down Strike provides fascinating information on the labor movement, capitalism, workers rights, and protest strategies for both historic and modern investigation. This site seeks to capture the spirit of that time through rare audio recordings and interviews with members of the strike. The site seeks to be an educational resource that introduces students and citizens to the events of the strike and encourages more critical reflection and understanding.